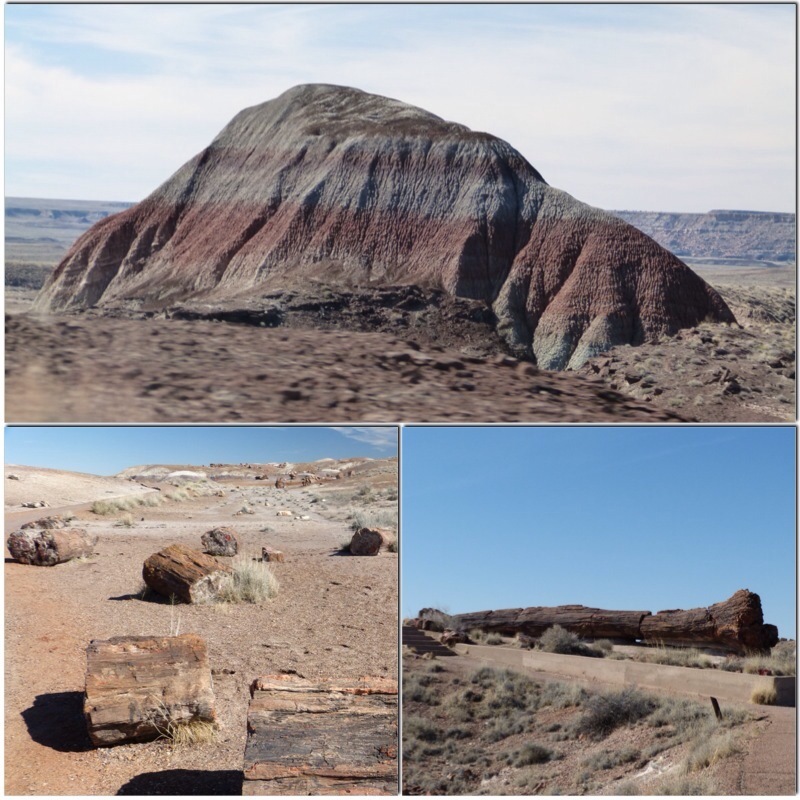 Today’s first stop was the Petrified Forest National Park, a little under an hour’s drive west of Gallup. The first thing we discovered was that it is really two quite distinct parks, which we supposed had been bundled together for geographical convenience. It wasn’t that this mattered much, but it did mean that the visit was a lot more involved than we’d first expected. A little way north of the main visitor centre (where we watched the obligatory informational film) the road winds along a ridge, affording some incredible views of the Painted Desert. 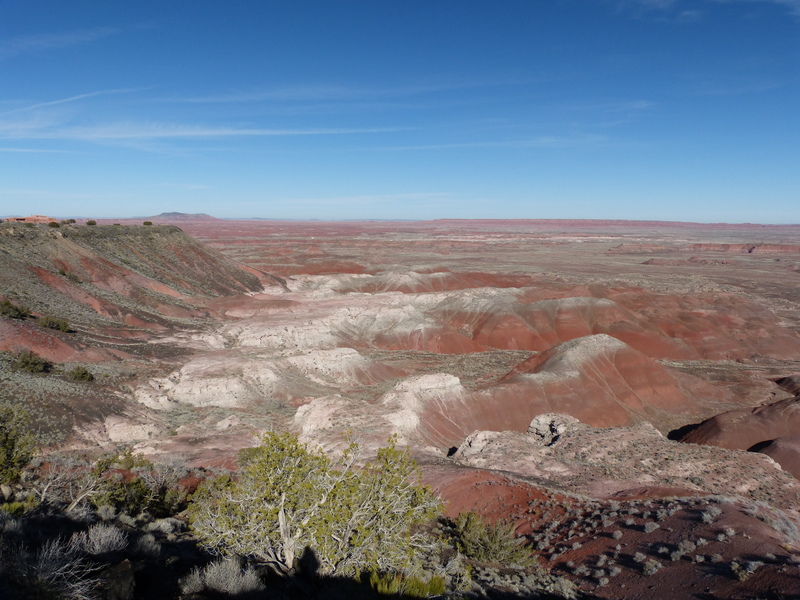 We parked the car and took a short walk along a trail, pausing every few moments to admire the views of the Chinle Formation below, and to read little signboards which described some of the local flora. Back in the car, the route continues along the ridge before looping back around and heading south to the other section of the park. Our next stop was Puerco Pueblo, the ruined remains of a major settlement which seems to have been abandoned some time in the 14th century. 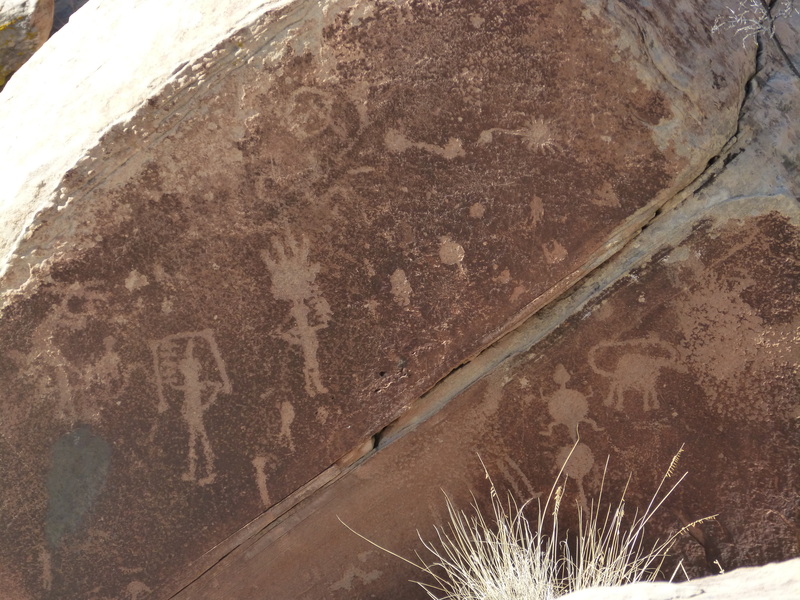 As well as the ruins, and more great views across the desert, we admired petroglyphs carved by its former residents. Still further south, the colours of the rock changed from pinks and reds to greys, blues and purples, and we began to notice chunks of old trees littering the landscape. 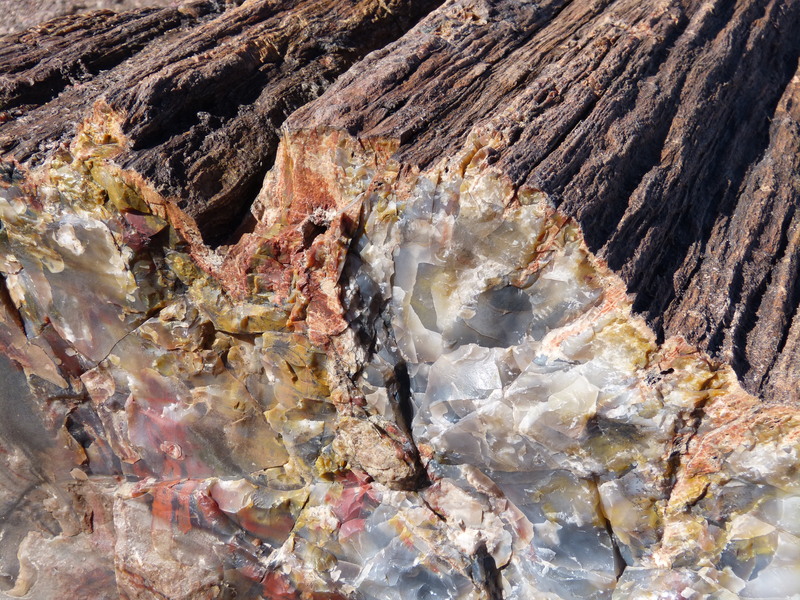 These petrified remains of ancient forests apparently date back some 200 million years, and whilst the exterior appearance of bark is deceptive, the fossilisation process saw all the wood replaced with quartz (and occasionally other semi-precious stones such as amethyst and jasper), which various minerals have stained a remarkable range of hues. The remainder of the park (another 15 miles or so) was taken up with a number of stops to look at clusters of these trees, as well as still more of those desert views. By the time we’d finished it was after 1pm, so we zoomed on to the next town and found ourselves in yet another quirky little establishment on Route 66. 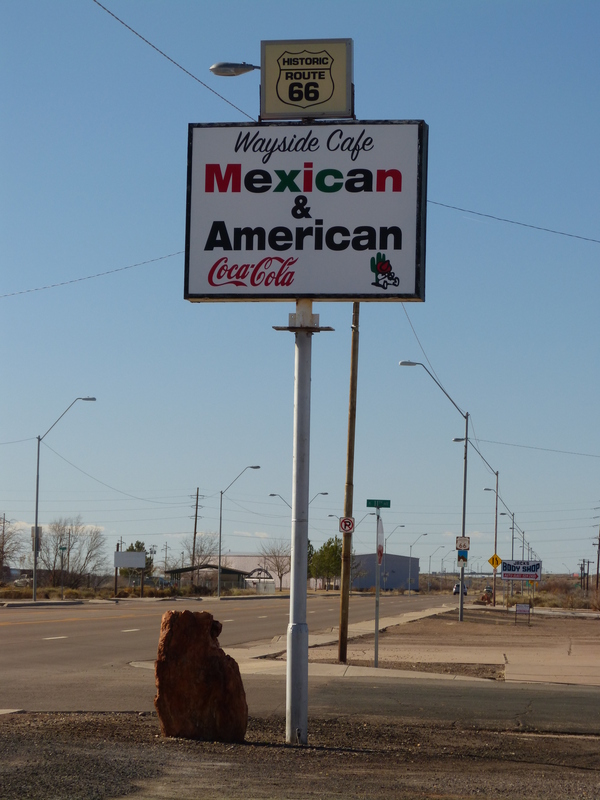 The Wayside Cafe in Holbrook is a friendly family-run cafe, and we wolfed down generous platefuls of Mexican staples. 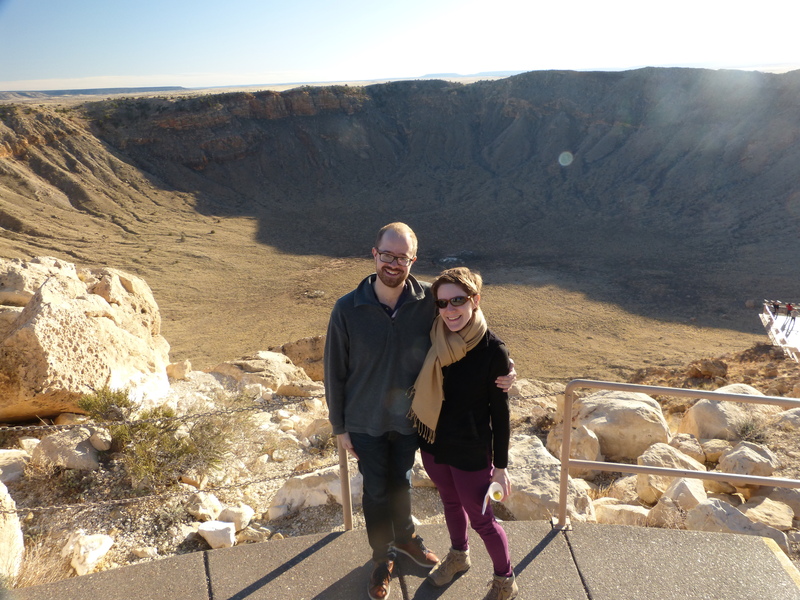 Next on the itinerary was the Barringer Meteor Crater, where we nearly didn’t get any further than the ticket desk as I strongly objected to paying $18 per person (plus tax, of course) to look at a hole in the ground. 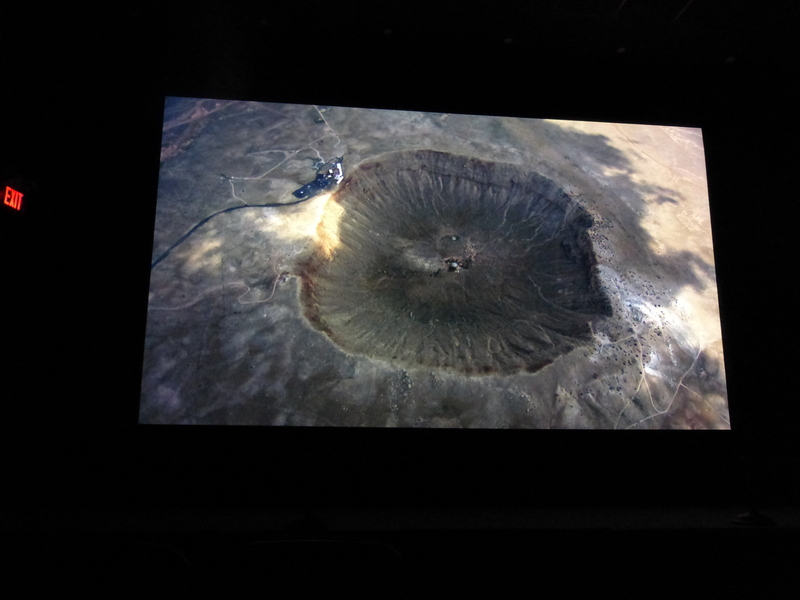 Fortunately Tom prevailed, as the crater was quite spectacular, and the accompanying museum and informational film were very nicely done too. Formed by a 26,000 mph impact some 42,000 years ago, the crater is 550 feet deep and has a circumference of 2.4 miles. Sadly visitors are only allowed to look into the crater from a set area on the rim, but it was definitely worth seeing, and we learned all kinds of interesting things about meteors, impact geology and related topics. 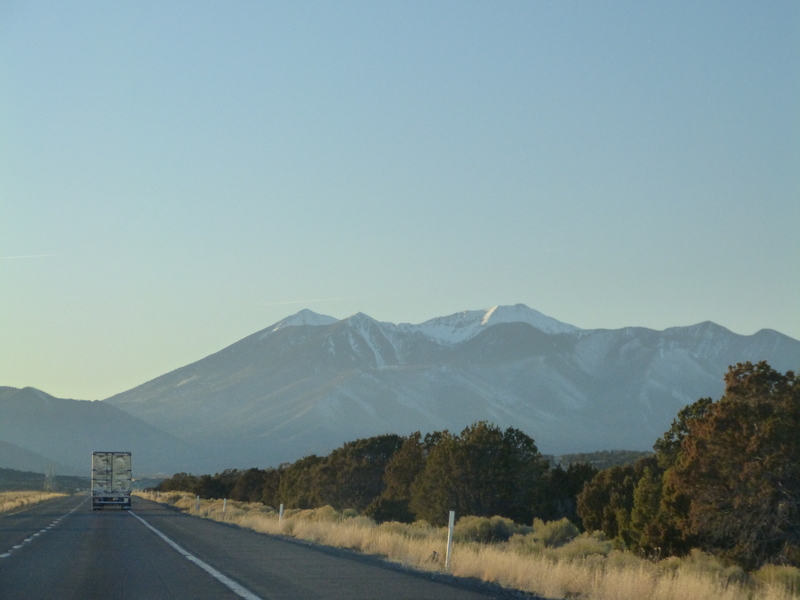 Back on the road for the final hundred miles of the day, we watched as the snow-capped San Francisco Peaks drew ever closer, before turning north just before Flagstaff. We’d been admiring the most prominent of these, Humphrey’s Peak (the highest natural point in Arizona) across the desert all afternoon, so it was a little strange to find ourselves in pine-covered foothills. The road took us up just above 7000 feet before heading down into the desert again, but by that time it was almost dark, so the final stretch of scenery passed by unnoticed. This entry was posted in Exploring, Holidays, Travel and tagged desert, driving, fossils, Four Corners, meteors by Emma Davidson. Bookmark the permalink. Thanks Ben. I just saw your bucket list post from January – we hiked the Inca trail a few years ago, it was amazing! Oh I see that’s sweet, I’d love to hike that trail. It’d be so phenomenal!! If you ever get the chance you should definitely go! Peru is such a great country too.